The Spyderco Endura has been around for a very long time now and currently in its 4th generation. Over the years the Endura has developed a large following and become one of Spyderco’s best selling models. For good reason too, it’s very light weight, thin and has great blade geometry for cutting. In this review we focus on the Endura 4 in ZDP-189 steel with the British Racing Green FRN handle (model C10PGRE). The Endura gets a dolled up in high-end ZDP-189 steel for a huge performance boost. As one of Spyderco’s mainstream models made in Seki, Japan the Endura has become somewhat of a staple in the knife industry. It’s been produced in a number of different steels over the years including several limited “Sprint Runs” and also a large variety of different handle colors and materials. The current standard models are either in VG-10 and the superior ZDP-189 stainless steel that is the focus of this review. ZDP-189 is a Japanese made steel by Hitachi that has an insanely high carbon percentage at 3.0% and a chromium content of 20% with most of it being pulled into developing carbides (hard, wear resistant particles) instead of fighting corrosion. You see, typically it’s chromium that’s responsible for corrosion resistance in knife blades, but in this case despite the chromium percentage being very high it’s not all that stainless because of the large amount of chromium pulled into the matrix. All this makes for high wear resistance and impressive cutting performance. No, it won’t rust while you are looking at it, but normal care will be needed to prevent corrosion. Normally ZDP-189 is run at extremely high Rockwell hardness in the 64 to 68 range. The subject knife was Rockwell tested at 65 HRC so it is right in the normal range for ZDP-189. So, it must be impossible to sharpen right? Not quite. While being very hard at 65 HRC it’s not really all that difficult to sharpen due to those chromium carbides not being as hard as vanadium carbides that you often find in high end steels. The chromium carbides simply don’t fight the sharpening stones like the vanadium carbides will. It is notable that with the high hardness and the thin blade geometry of the Endura at .118” it’s not a pry bar and it has a pretty fine tip for finer work if needed. Although it does take a light touch on the stones for best results, not really all that bad however, but it can take some getting used to. Touch ups can be done on the Spyderco Sharpmaker or your standard silicon carbide bench stones. ZDP-189 also responds well to stropping with various compounds, diamond stones and various ceramics. At 4.98” long the British Racing Green FRN handle is large enough to fit the majority of hands while not being too bulky for people with smaller hands. Spyderco rounded the edges nicely while providing generous jimping and two way texture on the main body of the handle. That provides a good non-slip grip while not being too aggressive. The handle is narrow and not too fat so it rides nice and small in the pocket. FRN is Fiber Reinforced Nylon – a super lightweight and near-indestructible material that’s inexpensive. It tends to be a little less grippy than G-10 if not properly textured. With 4 way carry, right or left hand, tip up or tip down you have every possible choice of carry positions. The Endura comes out of the box tip up, right hand carry, but it’s easy to change the clip position if needed. It’s also very quick to deploy due to the classic ‘Spydie Hole’ as the thumb finds the hole quicker than it would a thumb stud. Lockup was solid throughout the testing. The Endura uses a back lock, also called lock back or mid lock. While not considered one of more advanced locking mechanisms in today’s market it works equally well for both right or left handed users and is generally pretty adequate. Fit and finish was decent as expected from Spyderco’s Seki Japan models, the blade had a nice smooth satin finish. I didn’t notice any quality control issues, blade play or burrs and the blade was nicely centered. Jimping on the blade was well done and clean. The handle also has jimping on the top to help with grip which seemed to work fine. Overall the Endura was well within quality standards for knives in its price range. Now we get down to it, how does the Endura in ZDP-189 Perform? 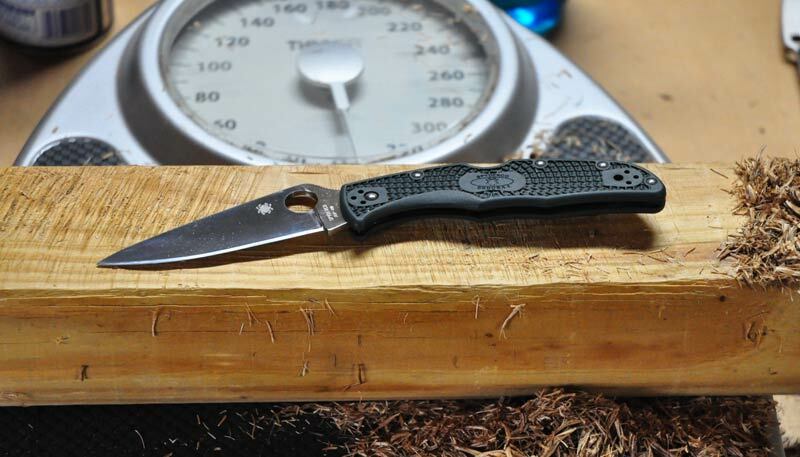 Similar to the in-depth testing I performed on the Spyderco Military S110V, I ran the Endura through the same line-up of 5/8” manila rope, cardboard, wood, 175# zip ties and power cord. Before starting I reprofiled the Endura to 15 degrees per side using a Moldmaster 320 grit Silicon Carbide stone and finished with a 400 grit (40 Micron) Moldmaster Silicon Carbide stone. I started with the 5/8” manila rope first, it’s surprisingly hard on edges and not easy to cut. The edge has to be both sharp and aggressive to cut rope cleanly. My process is to use draw cuts, I put wood on my scale and cut the rope on the wood and keep track of down force. I cut until I reach 20 LBS of down force, that’s one draw cut that passes all the way through the rope equals one cut. I check the starting down force and then check every 20 cuts until 20 lbs is reached and the process is over. The Endura started out at 9 LBS of down force and made 420 cuts on the 5/8” manila rope until it reached 20 LBS. It cut very aggressively with the 400 grit edge I put on it for testing. I didn’t notice any chipping or rolling going on with the edge. It remained sharp enough to slice phone book paper until the end and still had some bite. I re-sharpened the edge after the rope cutting stage to finish the rest of the testing, from this point on the edge was not touched up or sharpened in any way. Next up was cardboard. I use cardboard because most of us associate “EDC type” use with opening boxes or cutting up cardboard. It can be very abrasive and kill the edge very quickly on less wear resistant steels. Cardboard can also be somewhat unpredictable, having clay or other random junk in it. My process is to cut 100 linear ft of cardboard and check for both sharpness and edge damage. I keep going until the edge loses sharpness (no longer able to slice the phone book paper) or I’ve simply gotten through too much cardboard and call it a day. The Endura cut 3,000 linear ft of cardboard before it started having issues cutting the phone book paper. It would still cut it, but would start to hang up sometimes so I decided to stop at this point. I noticed some minor edge wear which was the cause of it hanging up on the phone book paper. The edge still had good bite and was more than sharp enough to easily slice printer paper and news print. 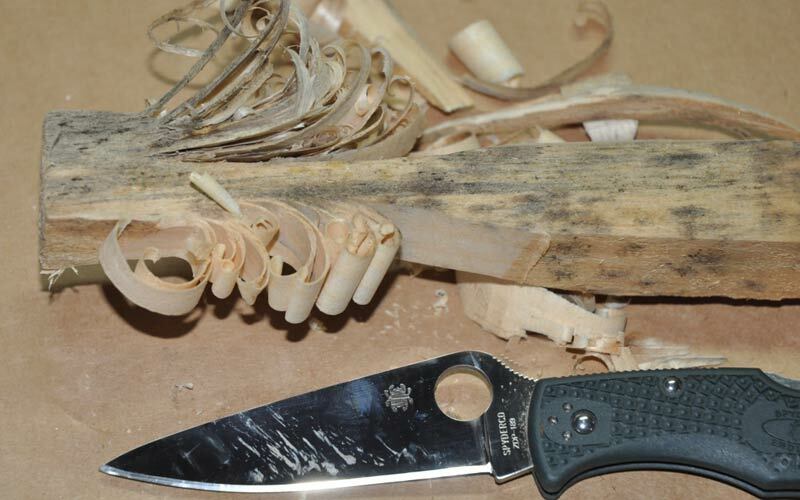 Cutting over ½ a mile, 1,000 yards or almost a kilometer of cardboard is a lot for any knife and still remain sharp. Here I use wood to test the edge stability because I cut deep and shallow along with snapping the edge out sideways on a 45 degree angle. No damage or loss in sharpness was noticed from performing this test. Up next was 175# heavy duty zip ties. I typically use the zip ties to stress the edge – they tend to be very hard on edges. I push cut through the Zip Ties 20 times and check for any kind of damage or loss of sharpness. Guess what? No damage or loss in sharpness after the zip tie cutting. All this despite zip ties being very hard to cut through with me pushing the edge through with my hand. This caused the edge to stick in the wood after each cut. Last was the power cord test. Here I’m testing for edge strength and stability when cutting though plastic encased copper wire. I push cut through the power cord 25 times and check for damage or a loss in sharpness. Cutting the power cord took some force, cutting very clean and in the end I noticed no discernible edge damage. On the whole, the ZDP-189 with the 400 grit edge finish held very well to the in-depth testing routine. It didn’t match up to the ultra-performance of the Military’s CPM-S110V blade but nonetheless was an outstanding performer. In looking at alternatives to the Endura ZDP-189 I listed a few knives to consider below. The obvious first choice would be the standard Spyderco Endura in VG-10 which is much cheaper at about $70 and has a large variety of handle colors to choose from. VG-10 will also be much easier to sharpen and is more stain resistant than ZDP-189. So if you live in a harsh environment this would be an excellent option. Next would be the Spyderco Delica ZDP-189 at around $95, which is both smaller and lighter than the Endura. Another long time classic from Spyderco and a tremendously popular EDC for many. The Delica’s blade is 2.87” in length compared to the Endura at 3.8”. The Delica is also lighter at only 2.5 oz compared to 3.3 oz for the Endura. If you don’t need ZDP-189 then the Delica is also available in VG-10 at around $67 with a variety of colors. Another to consider is the Spyderco Stretch ZDP-189 at around $119, slightly more expensive than the Endura ZDP-189 which is about $10 or so less. The Stretch has a unique blade shape (full flat ground) which is slightly shorter at 3.4” compared to the Endura. Consider it an option in between the Delica and Endura in terms of size. The blade is also much thinner than both the Delica and Endura too (and even thinner than the Military). It’s slightly heavier than the Endura at 3.4 oz. Finally look at the immensely popular Benchmade Griptilian at about $99 – slightly cheaper than the ZDP-189 Endura. The Grip’s blade is slightly shorter at 3.45” in 154CM steel and comes with the impressive Axis Lock that continues to be super popular and for good reason. For those who don’t like lock-backs it could be a good option. Weighs about the same as the Endura. Before you take the plunge on the Spyderco Endura ZDP-189 there are a few things you should consider. First, do you really need a high performance steel like ZDP-189? While not impossible, sharpening ZDP-189 can be a challenge for some. 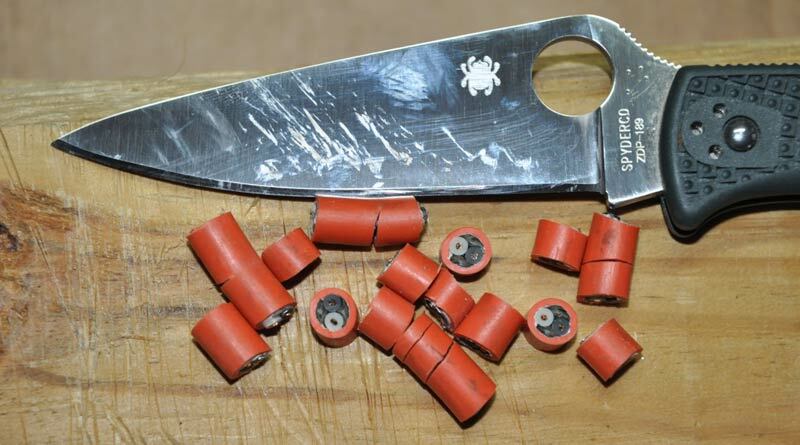 You can get by even with a simple tool like the Sharpmaker but you should expect to spend quite a bit more time than using a softer steel like VG-10. Do you live around saltwater or in a humid climate? Consider that ZDP-189 is not as corrosion resistant as most other stainless steels including VG-10. Then again it isn’t a rust magnet and simple care will keep it free from corrosion. What are the legal restrictions on blade length in your area? The Endura has a relatively long blade at 3.8 inches which may be illegal in your state. So is the ZDP-189 Endura the knife for you? It can be if you need a high performance cutter that is very light weight, easy to carry, feels go in hand, and reasonably affordable. The Endura ZDP-189 performed very well overall, fit and finish was good and can be used for some real work if needed. It’s a really nice EDC knife which represents good value in today’s market and will serve you well if properly cared for. The Good: Light weight, easy to carry, 4 way pocket clip, thin geometry, ZDP-189. The Bad: ZDP-189 might be hard to sharpen for some, could stain in harsh environments. Bottom Line: Great EDC for those wanting the longer blade and superior performance.